While utility incentives, labeling programs, and federal standards have helped improve the energy savings of other home appliances by as much as 50 percent, America’s 89 million home dryers have remained “essentially the same,” Horowitz adds. The United States doesn’t have to reinvent the wheel, however. NRDC’s researchers say that incorporating existing technology used abroad, as well as adopting recommended technical and policy changes, could pare down American dryers’ $9 billion annual electricity bill by 40 percent. The move would also curtail about 16 million of carbon-dioxide emissions per year—the equivalent of taking three coal-fired power plants offline. The make and model of the dryer isn’t the only factor in energy use; the way a consumer uses a dryer is almost as important. Horowitz suggests operating the appliance at a lower temperature, which can slow the drying process a little but slashes energy use considerably. Stopping the dryer before clothes are bone dry also saves time and energy, reduces wrinkles, and helps them maintain their integrity longer. Other interim steps we can take to curb laundry-related energy use? The NRDC recommends using the washer’s maximum spin speed to reduce the amount of water remaining in the clothing before they’re transferred to the dryer. 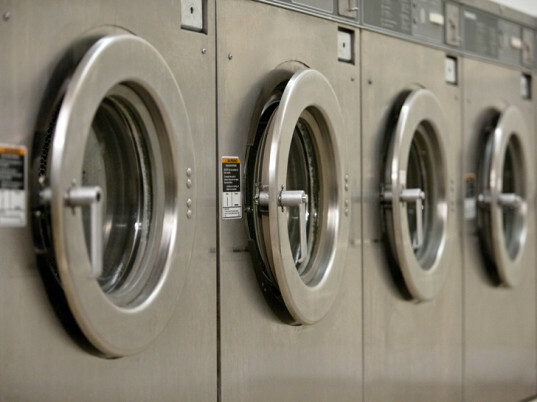 Plus, selecting dryer cycles like “delicate” cuts energy use, while resisting the urge to overfill the drum gives clothes more room to tumble-dry more efficiently. Then there’s this oldie but goodie: clotheslines, no fossil fuels required.